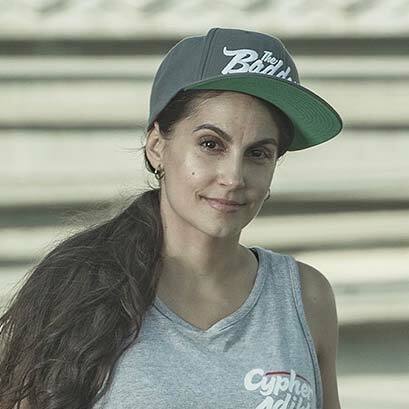 Born and raised in Paris, French Algerian Bgirl Jeskilz found Hip Hop at the age of 15 but it wasn’t until she moved to NYC right after hight school graduation in 2001 that she discovered her love for breaking. It all began at “The Point” a community center located in the Bronx where she became great friends with Mach3 of SkillMethodz Crew who started teaching her everything he knew. No other form of dance had reached her in this way and she was determined to fully commit in order to earn her respect within the scene. In 2004 Jeskilz met Alien Ness who inspired her as well and introduced her to Crazy Legs of the Rock Steady Crew. Soon after she was asked to be down. For the next couple of years she represented to the fullest battling every chances she got and established herself as one of the best bgirl in the game. She packed again and moved to Los Angeles in 2008 hoping to find success in the dance industry. She quickly landed major roles in movies and commercial but never found herself content the way she did within the Hip Hop community so in 2011 she decided to give birth to an idea that had been in her mind for years called CYPHER ADIKTS, a jam that would bring back the essence of the dance stepping away from competitions and all kind of set up rules. Cypher Adikts not only represented the ideal concept to her it also embraced a mentality she had always related to from the start. Jeskilz’ main mission’s been to give back to the community, through Cypher Adikts she’s been able to inspire and educate the youth worldwide into experiencing what our culture is truly all about. Jeskilz continues to rep and be a voice for b-girls who are often not recognized or given enough credit for their contribution to the scene by organizing an annual original concept part of the CA anniversary called Leaders Of The Ground featuring Bgirls battling a Bboy of their choice in a 1on1 cypher battle.